A popular holiday destination for over 150 years, Coney Island offers ocean swimming, amusement park rides and a lively Boardwalk– all in the heart of New York City. 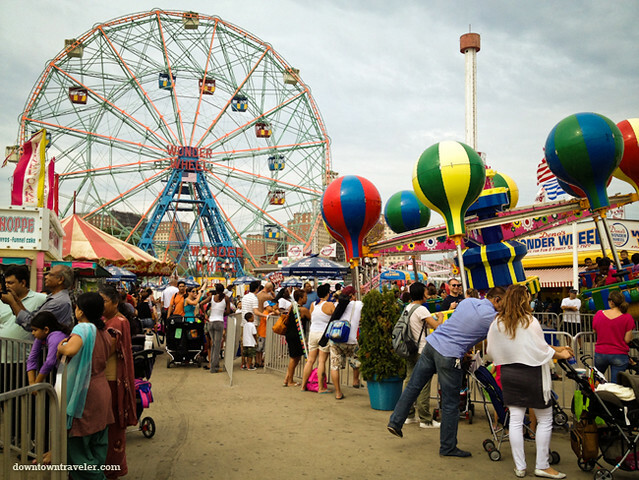 Coney Island is an easy and inexpensive day trip from Manhattan and should not be missed. Read on for my top 5 attractions in this famous Brooklyn neighborhood. >> Have you been to Coney Island? Share your favorite attractions by leaving a comment below! We recently spent a day exploring Coney Island and neighboring Brighton Beach, a Russian enclave. 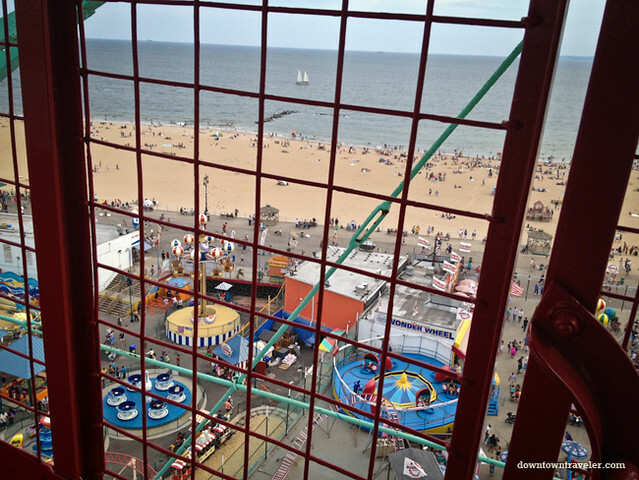 After filling up on potato dumplings in Brighton, we walked down the Boardwalk to Deno’s Wonder Wheel Amusement Park. Deno’s giant Ferris wheel looms over the horizon and seems to be the center of all paths through the park. 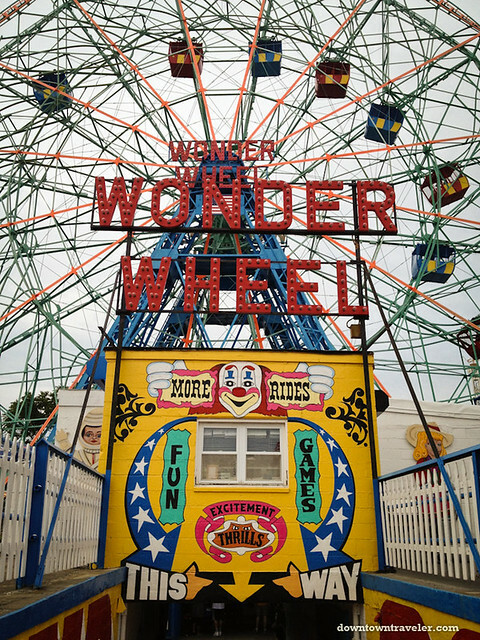 The Wonder Wheel offers an amazing view of the shore, as it extends 150 feet at its peak and is billed as the tallest Ferris wheel in the world. Opened in 1920, the Wonder Wheel offers two options for cabins: stationary or “swinging.” After purchasing two $6 tickets, we waited on the “swinging” line, which was by far the most popular. I was expecting a genteel ride, but the metal cabin violently lunged back and forth and at one point seemed ready to to drop off a precipice. If you aren’t afraid of heights, opt for this thrilling experience! Coney Island is something of a paradox: Its beach and amusement park offer a much-needed escape from the grind of city life, yet its spirit remains as gritty, resilient and eccentric as anywhere in the Big Apple. 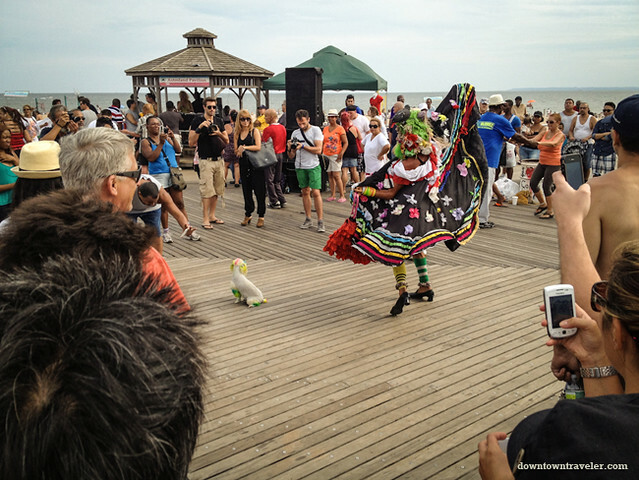 The boardwalk is a great place for people-watching; when we visited, a dance party had formed and a diverse group was getting down to electronic beats. Revelers included a man in a frilly tutu, accompanied by a rainbow-colored dog (we’ve actually spotted him before at the Gay Pride Parade). The Coney Island boardwalk is also the backdrop for the annual Mermaid Parade, which is known for its colorful costumes. Vintage black and white photos of Coney Island show the beach so packed with sunbathers that no stretch of sand is visible. Fortunately, visitors no longer have to contend with those massive crowds, although the beach remains much more popular than neighboring Brighton Beach (which has identical sand and surf). The lure of Coney Island’s beaches isn’t tranquility, but the proximity to the amusement park and the frenzied atmosphere of the Boardwalk. Coney Island is known for its hot dogs (this is where Nathan’s famous hot dog eating contest is held), but there are still plenty of food options for vegetarians. The Boardwalk is the perfect place to devour an ice cream from Coney’s Cones. We recommend the chocolate and dulce de leche flavors! 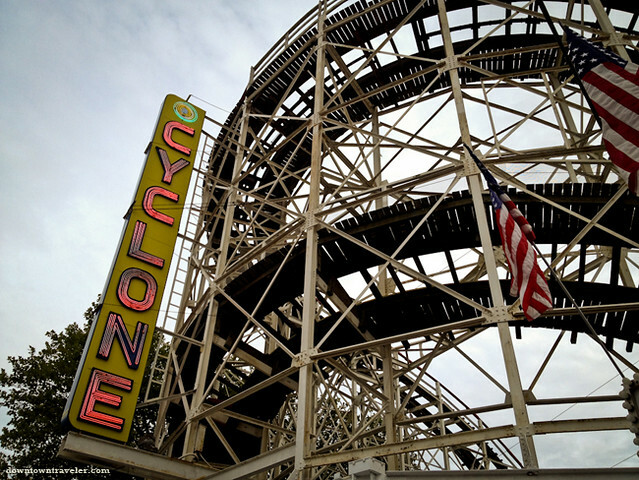 You can’t visit Coney Island without experiencing its most famous attraction, the Cyclone, which is a registered New York City landmark. This wooden roller coaster opened in 1927 and feels very different than modern rides. You’ll feel every bump as your car speeds on a vintage railing over wooden slots; while there are no upside-down loops, the sudden drops will make your stomach drop. (A warning sign cautions people with heart problems not to participate). I am not a huge roller coaster fan, but this brief ride (which lasted about a minute) was well worth the $8 admission fee. Coney Island is about an hour from Manhattan via the N, D, F and Q subway lines. Get off at the Coney Island – Stillwell / Surf Avenue stop and walk a block to the Boardwalk. 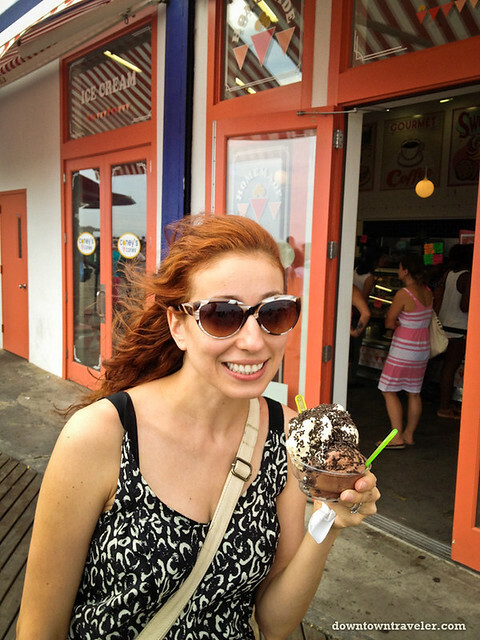 We recommend combining a Coney Island visit with a stop in neighboring Brighton Beach. What do you like best about Coney Island? Share your pick by leaving a comment below! If you are reading this via email or RSS feed, click on Downtown Traveler to leave your comment. It looks so retro in the photos. Last time I was there (many years ago) it was just plain shabby. Many years ago- in a universe far, far away on hot summer nights before air conditioning in house or car- my father would drive us to Coney Island. I’d ride the Merry-go-Round and then off to Nathan’s for hotdogs. Some nights we’d drive to Sheepshead Bay and feast on raw oysters and fish and chips in rolled newspaper. You brought back memeories! I’ve never been there but I was just talking to someone about Coney Island on the weekend. He said it was an incredible blend of old school carnival with modern day fairs. That’s an accurate description of Coney Island– the amusement park is super old school, especially the children’s rides. They look like they are straight out of the 1950s! I haven’t been on the rides (I’m not a fan of them in general), but have walked the Boardwalk – always interesting for people watching! Dying to go on the cyclone!! im a sucker for roller coasters… LOVE EM! Absolutely should not be missed! the Boardwalk is awesome! good post and beautiful photos! I love roller coasters and thrill rides, but that Wonder Wheel scared the bejesus outta me! Kinda feels like it could crumble beneath you at any moment, but once you get used to the clammering cage, it is pretty fun and a great view of the beach! Thanks for the comment! Actually, Coney Island’s Ferris Wheel is a bit terrifying too– it’s about 100 years old and seems to be held together by paint and rust. If you want a bit of adventure, wait for one of the “swinging” cars! Wow! I have to get to Coney Island. It looks like so much fun. It would actually be a great day trip from Washington, DC. The Chinese buses offer round trips for $30! Nathan’s in Coney Island has a manager who has gone vegan and they will soon be offering veggie burgers! I love Coney Island and though I’ve lived upstate for decades I still find myself at Coney Island whenever I visit family in Brooklyn.